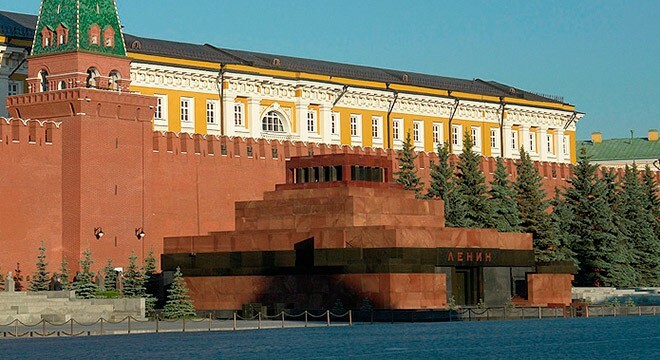 The Lenin Mausoleum – a monument burial vault on Red Square near the Kremlin wall. Most of the post-Soviet historians suggested that the basis of the idea – to create a new religion for the victorious proletariat. Stalin intended to restore the historical paradigm of giving people in the person of the king himself and God in the face of Lenin. The Bolsheviks intend to create pagan cult, which “was a source of faith … a mummy idolized ancestor – the Secretary General”. First temporary wooden mausoleum was erected for the day of the funeral of Vladimir Ulyanov (Lenin) (27 January 1924). The building consisted of three main parts, but because of the the short time of construction the mausoleum left unfinished and only stood up to the spring of 1924. During the month the architect Melnikov developed eight plans for a second wooden mausoleum. One of them was approved and then implemented as soon as possible under the supervision of the author. This sarcophagus was in the mausoleum until the end of World War II. Laconic forms of the second mausoleum were used in the design of the third, now the current version of reinforced concrete, with brick walls and facing with granite, marble finish, Labrador and crimson quartzite (porphyry) (1929-1930, designed by Shchusev with a group of authors) . Inside the building there are the vestibule and the memorial hall, 100 m²; opposite the main entrance is set the coat of arms of the USSR. During the Second World War, in July 1941, the body of Lenin was evacuated to Tyumen. In 2013 it was reconstructed, the first phase – strengthening the foundations of buildings. During the work the internal volume of the mausoleum no way affected. Ahead – the second stage of the work – dismantling the extension located behind the Mausoleum – previously there was an escalator to lift the party and government leaders, now it is building is not in use.